While discussing the many issues plaguing Kyrgyzstan in the wake of violent ethnic conflict within the country, the delegates in the Second Kyrgyzstan Revolution: Interim Government of Kyrgyzstan received a visit from Dr. Bakyt Beshimov, the former Ambassador of Kyrgyzstan to India, Nepal, Sri Lanka and Bangladesh. Beshimov, a prominent opposition leader who was twice elected to the Kyrgyz Parliament and served as the deputy chairman of the Social Democratic Party of Kyrgyzstan, sat in front of delegates to discuss his opinions on the events occurring in Kyrgyzstan in 2010 and gave insight on what topics and concerns delegates should address in committee. Delegates were able to ask Beshimov questions to further their knowledge about the Kyrgyzstan government. The delegate Almaz Atambayev asked why the United States continued to be involved with Kyrgyzstan, and what drove the country to give aid to Kyrgyzstan. Beshimov answered that Kyrgyzstan had hosted an air base after the attacks of September 11, which had fostered a rivalry between Russia and the United States. Noted that other neighboring countries posed a threat to Kyrgyzstan, Beshimov stressed the dangers posed by Uzbekistan and Tajikistan to the Kyrgyz government. Beshimov informed delegates that while Kyrgyzstan gets energy through hydroelectric measures, they need gas from Uzbekistan, who utilize gas as a weapon of manipulation. 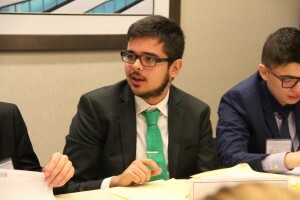 Beshimov, before leaving the committee, reminded delegates to address multiple issues on a variety of levels.